Halloween is next Friday, and we feel you now have increased understanding of the imminence of the scary occasion that is upon us. So here we have an updated list of the most exciting, albeit hair-raising (in a good way), Halloween events compiled for your perusal. Halloween has traditionally been an event for the kiddies, who enjoy skipping about the neighbourhood and disintegrating their teeth with a quickened pace via overly high levels of sugar intake. Whilst there are a few tucked in this list for the little ones, there are plenty of events and mixers for the adults to scare themselves with also. Children, we are going to need you to STEP, ASIDE. 22 Ships and Ham & Sherry, on Ship Street, in Wan Chai, are feeling frightfully generous and offering a $2000 bar tab for the best dressed individual of the night. Challenge accepted. 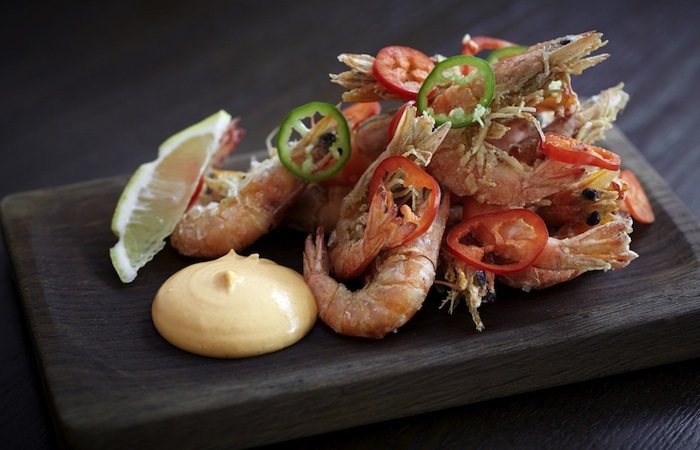 Their terrific bar menu will remain amongst the drinks offerings, which means you can bask in the tasty glory of the likes of garlic and chilli prawns while sipping your spiced pumpkin Jack o' Lantern! The first 50 people get goodie bag treats and there are other frightful drinks like Witches Brew and Trick or Treat Shots. In fact if you just show up in a costume you will be entitled to a complimentary Black Sparrow rum punch, and if you have eaten at 22 Ships, you get to pop over for a complimentary Trick or Treat shot! Why Go? Because with the many incentives for fancy costumes, all resulting in complimentary drinks, you will definitely have the motivation to ‘freak out’ in your costume and get rewarded for it! 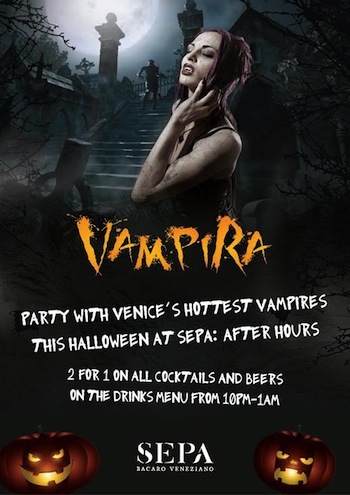 If Halloween creeps up on you on Friday and you have had a nice dinner and don’t quite feel like partying all night, you can join Venice’s hottest vampires at SEPA: After Hours on October 31, and enjoy 2-for-1 drinks on their signature cocktails and beers from 10pm – 1am. They will be dressing up as someone from Dracula, True Blood, Twilight, Vampire Diaries or some other cult following, which in modern terms means dressing very stylishly, adopted an anaemic countenance, and staying out of the sun for the week. How much: Cocktails go for around $138 and you get two of ‘em when you buy one! Why Go? Stylish Venetian hosts, strong bold cocktails at half price, and probably some of the best looking people in Hong Kong pretending to be fabled beasts. Sounds like our kind of party…. A special Halloween menu with a complimentary blood cocktail makes this scenic, harbour front venue an ideally subtle place to have a a wonderful night of spookish enjoyment. It is close enough by to not feel like you’ve ventured to China to celebrate, and yet is out of the madness that will be anywhere from Kennedy Town to Admiralty on the Friday night. Why Go? Risotto of porcini and cilantro with truffle oil and grilled US striploin on hot ‘ghoul’ mustard relish. Yum. Brave adventurers can start the devilish meal with treats from the little house of horrors featuring Vampire’s Melba, Sea Creature Wrap and Jack-o’-Lantern (a trio of foie gras de canard, soft shell crab and unagi), then take a sip of the mysterious concoction – Witches’ Poison Ivy Brew with Graveyard Snails (water-spinach and sorrel soup, burgundy snails, breadstick snake). The menu goes on a tasteful yet strange adventure, with an exploration of enjoyment in the Caretaker’s Supper, an alluring platter of Devils on Horsebacks and Skeleton Ribs (bacon-wrapped shrimp and BBQ back ribs), as well as Toadstools with Vampire Repellent and Blood n’ Guts Potatoes (sautéed mushrooms with garlic and thyme, and cheddar baked potatoes). So many themed dishes, and so much stunning vista to take in. Elephant Grounds, for those who have been hibernating the last year or so, is perhaps one of the cooler cafes in the city. We love their artistic flair and that they are always working on being creative, shown in their recent collaboration with Abei, which is an independent designer based in Taipei. They have some killer weekly ice-cream sandwiches too (this week’s special was a milo ice cream with earl grey cookie number. DEE-lightful!). They are getting aboard the Halloween train, and presenting us Hongkies the wonders of pumpkin spiced beverages. Which is overly alluring for the Saturday afternoon, when you will be nursing a sore head and needing to catch up with the crew about the goings on of the previous night. 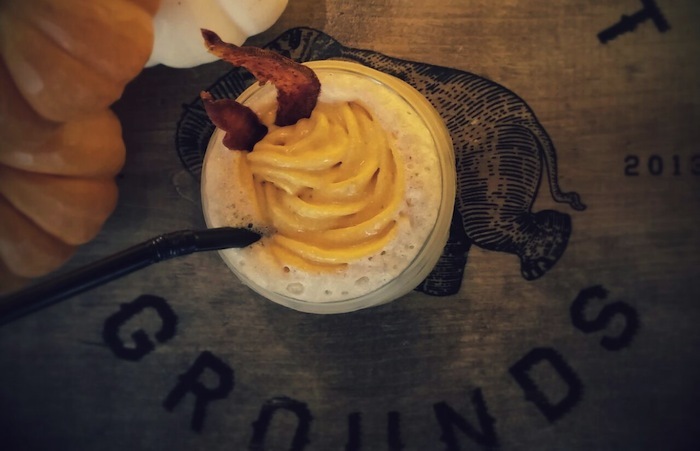 Not needing a meal but definitely something cool to sip, the Elephant Grounds has you covered. And because they do everything else so well, you can be guarantee that their festive drink will hit the mark also. Halloween can be a wonderful time of year where Hong Kong loves to party with friends and we all get creative with our costumes. At Fish & Meat, on offer is a stylish farm-to-table dinner cooked expertly by Chef Russell Doctrove and served with a special cocktail ‘the Pumpkin Tart.’ Be in the middle of the action without worrying for the queues and hustle and bustle in their restaurant above LKF. Guests are urged to arrive via Upper Glenealy Street due to traffic blockades. Why Go? 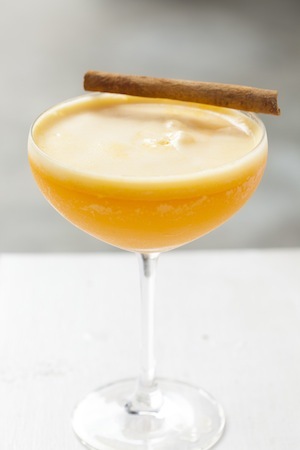 The pumpkin tart cocktail is utterly alluring and made with tequila, carrot juice, pumpkin, oregano and cinnamon. Très hip. Why Go? The “Jacinto” cocktail alone is worth it, made with bourbon, Islay whisky, honey, lemon, pumpkin and spice, it’s a smoky song. Throw in the ultra vibes of Brickhouse down their little alleyway in the middle of the city, and let’s party people. 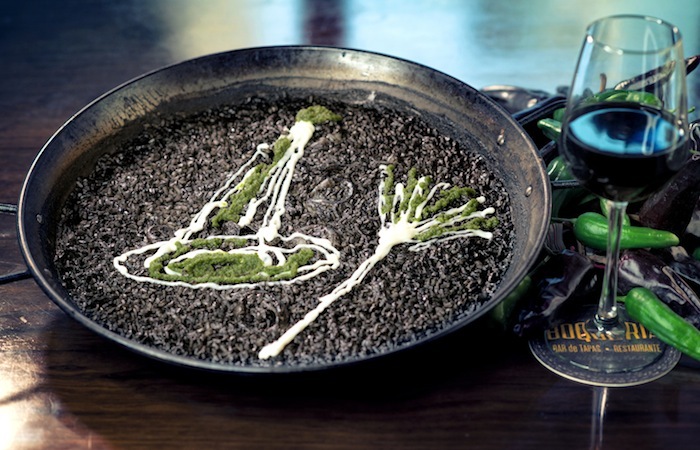 Black in colour, this squid ink paella is a classic Catalonian dish that boasts briny and subtly sweet flavours. 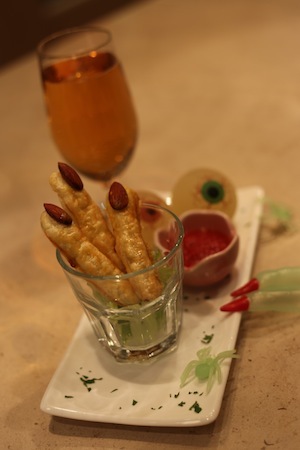 Garnished with a witch’s hat and broom, this dish is a delicious and quirky addition to Lan Kwai Fong’s renowned Halloween festivities. Also on offer is the limited edition Sangría de la Sangre (glass $88/pitcher $388), a vibrant blood orange concoction created in tribute to the gory holiday. Why Go? Because you can feel like you’re commemorating the eerie occasion without doing anything too outlandish. And dining in the Spanish joint, you get to drink sangria and eat paella; ‘nuff said. Ocean Park’s Halloween Fest 2014 takes guests through a surprising film world that features massive exciting family fun and sinister horrors, with just one ticket to experience double surprises from day to night! Confront the challenges of ultimate scares at H14 madhouse or step into the bloody old estate from Rigor Mortis LIVE! Laughter can be exchanged for the terrifying, and a special super-sized Doraemon Halloween Party is on offer with matching menus! Kids can also hug Doraemon, or so we’ve heard. Which is definitely something to put in the calendar. Why Go? Because you can evoke intense inner phobia, but then 15 minutes later you can turn it off. Which, although not at all realistic, is awesome. And one ticket ensures about 13 hours of exhausting entertainment, so you can save money and pass out on the way home. Mr. Steak is providing a luxurious and unexpected Halloween special dinner in the bloody butcher house, which includes Pumpkin Spider Salad, Dracula’s Soup (Spanish frozen soup), the Vampire Steak (an extra-large 1.2 kilo USA prime sirloin steak), Bloody Risotto (beetroot risotto with crispy soft shell crab), and a Devil Eyes drink, which uses lychee and strawberries to imitate an eyeball. It’s a little creepy, but the costs are very reasonable for the amount of food one receives, and the novelty factor is definitely there. Why Go? An enormous four course Halloween extravaganza in the Bay. This fancy dress event is on the rooftop of Butcher’s Club Deli and priced at $1250 per person. 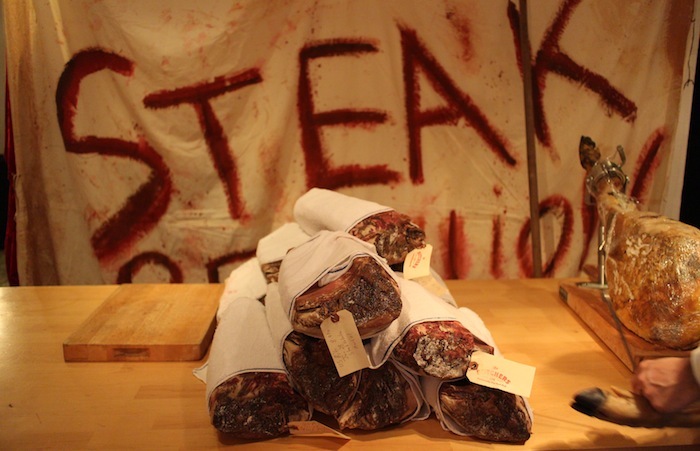 Probably one of the better packages around town, it includes a 5-course steak dinner, a bottle of wine per person (yes per person), live music from The Rolling Bones, the ghosts of butcher’s past, a Sweeny Todd style barber and a spooky face painter. You practically don’t need to get ready beforehand; just don your Captain Jack Sparrow outfit and the Butcher’s Club will take care of the rest! Why Go? Because the quality of meal is assured, and with a bottle of wine accounted for each person, it is going to be difficult not to have an amazing time. One for the family: starting at 12pm, the fun-loving team down at Frites have prepared a great lunch menu and lined up a selection of fantastic games, competitions and performers that will, no doubt, keep everyone playfully (and a little scarily) entertained! Youngsters will have their own ‘deliciously devilish’ kids menu to choose from, before well-known entertainer, Ciaran Love, starts a Halloween-themed magic comedy show at 3pm. The day ends with the much-anticipated “Costume Competition” where prizes are awarded for the best-dressed kids (and adults too) on the day. Enjoy creepy concoctions and a Halloween buffet with spooky dinner and drink specials, exclusively available on Friday 31st October, priced from HK$369. 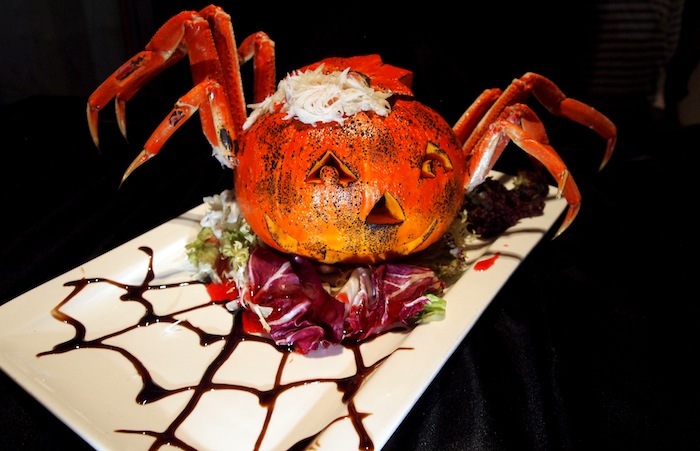 A semi-buffet that includes a variety of terrifying appetisers such as Pumpkin Soup, Devil’s Eyeballs, Jack o' Lantern Pasta, Bloody Shrimp, Mummies’ Pizza and Cheesy Ghost Burgers. For mains, choose from two of the Bubba Gump’s signature dishes; Shrimper’s Heaven or Dixie-style baby back ribs with shrimp. Last but not least, there will be spooky but delicious ghostly chocolate graveyards to finish off the night. The restaurant will be decorated with a number of terrifying decorations including spider’s cobwebs, laughing pumpkins and creepy crawlies creating a haunted atmosphere. Why Go? Bubba Gump is the quintessence of American culture, and they’re really going all out to hallmark the freaky occasion. The Peak Tower affords perhaps the most stunning views of Hong Kong, and you get to take a glass that lights up home with you if you buy a cocktail. Sparkly. From 24 October to 31 October, Skybar will turn into a mysterious world with the attendance of Mr Skeleton, Miss Witch, Pumpkin Face and some other friends who come over for celebrating Halloween together. A rowdy crowd. They have some scary but assuredly tasty snacks to relish, like the handburger and finger sausage as well as the Pumpkin Martini and Brain Hemorrhage for cocktails. How much: The two cocktails are priced $95 per glass, handburger $220 and finger sausage $70. Why Go? There are a number of Halloween Games, with a bottle of red wine is just at your fingertips, with views to gloat over. Hed Kandi parties are always off the chain, and Zuma is playing host this year to what will inarguably be one of the best Halloween parties in town. Hed Kandi are a glamorous lifestyle brand from the UK and will be in Hong Kong for one night only on Friday 31st October. 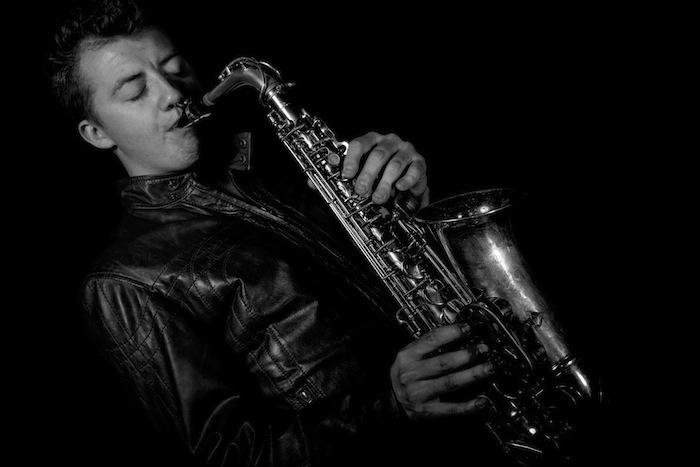 Hed Kandi’s international DJ Stuart Ojelay and live saxophonist Benjammin will be performing throughout the night on the sixth floor. Why Go? Guests will get special Halloween goodies and giveaways at Zuma that evening, and there is rumour of celebrities dressed up in costumes weaving in and out of the party crowd! The ever-classy ladies of The Woods have come up with some creations specifically for the night of the 31st. 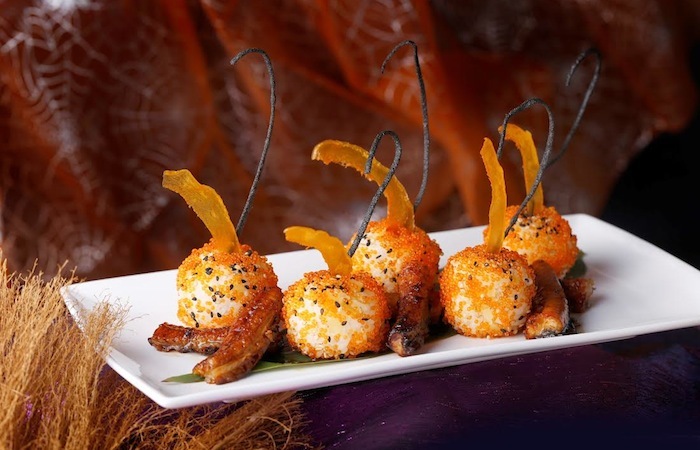 Squid Ink shots, Pumpkin Pie shooters and Spiced Pumpkin Bellinis are all on the menu, and in form with the Wood’s standards, set to elevate cocktails on Halloween to a whole other level. Tables are available for $4000HKD and up which includes Veuve Cliquot and pumpkin vodka. Why Go? Two drinks included in the ticket set you up for a good night and are great value for the type of liquid fortification you will be ingesting at the chic bar. It is a place to go if you genuinely enjoy a nice drink and would like a more elegant night.